Queenstown Bed and Breakfast accommodation - Queenstown Ski & Honeymoon accommodation B&B in New Zealand. You have found the best kept B & B accommodation secret in Queenstown. Lake Vista Bed and Breakfast with the magnificent 180° views of Lake Wakatipu & the Remarkables Ranges. This is what you will enjoy at Lake Vista Bed & Breakfast, along with some of the world's finest hospitality. Read what some of our recent lucky guests have said. Accommodation in New Zealand comes in many forms, but Bed and Breakfast is much more popular these days with travellers for accommodation while on vacation or ski holiday, due to the more personal in-home interaction with New Zealanders. In fact we get many couples on their honeymoon stay with us. At Lake Vista Bed and Breakfast, your guest accomodation features Under-floor Heating, Refrigerators, Personal Safety Deposit Boxes, Hair-dryers, Heated Towel Rails, Colour TV and Radio Alarm Clocks along with Tea and Coffee making facilities. Continental and/or full Gourmet Cooked Breakfast is provided. 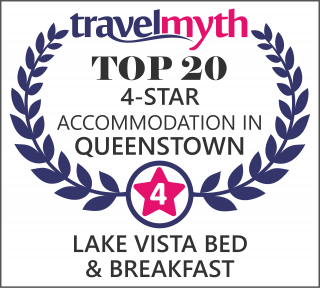 Lake Vista Queenstown B & B is very conveniently situated on Queenstown Hill, walking distance from town and 5 minutes from the Airport. We overlook the Frankton arm of Lake Wakatipu across to Deer Park (where much filming for The Lord of the Rings took place) to the Remarkables ranges. Limo transport available from Queenstown Airport or Bus Terminal. Can you see yourself waking up to these views? Views of Lake Wakatipu (part of header above) and the Remarkables ranges are not only from the Lounge at Lake Vista, but also from all guest rooms. Come & Stay at LAKE VISTA B&B. We now have a luxurious VW Van, which can carry 6 people if you need transporting around. Rates and specifications may change without notice. 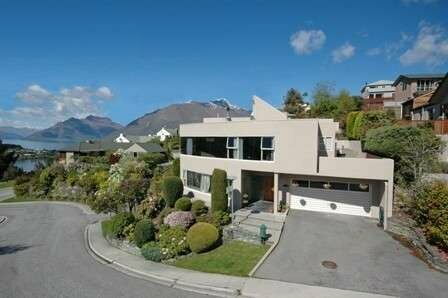 62 Hensman Road Queenstown, 9300, New Zealand. Click on any of the small images above to be taken to the virtual tour of that room. NOTE: Rotation speed of tour varies with position of your mouse. For your vacation or Queenstown honeymoon accommodation, simply fill in your dates & then your details on the Booking form on the left. Check out "tour of the house" and our "guest book", then for your next New Zealand vacation, or honeymoon, choose Lake Vista Queenstown accommodation, in the most beautiful part of New Zealand. If you have any questions, about our Queenstown B&B, don't hesitate to contact us.